Just. One. Book. One Month In. Just. One. Book. is still here! Yes. We are still here! OMG are we still here. But I didn’t post anything this week because I kind of needed a bit of a break–to start shelving books in earnest. And then my knee gave out (long boring story of life-long knee issue) so then I’ve been sitting and directing and sending out thank yous–as many as I can muster. But I haven’t been blogging–I have been working on my book though so yay me! Much has happened. The boxes keep coming but thankfully less than before. We can almost catch our breath. We have promises of shelving coming in. We de-commissioned much of what was left of the old library and are having a book sale of them. We have sections now! The kids can actually visualize what’s in my head. Sio this happened last Friday. My friend and teacher over at Quincy Junior High School came and got a class set of books + some other materials we had duplicates of. 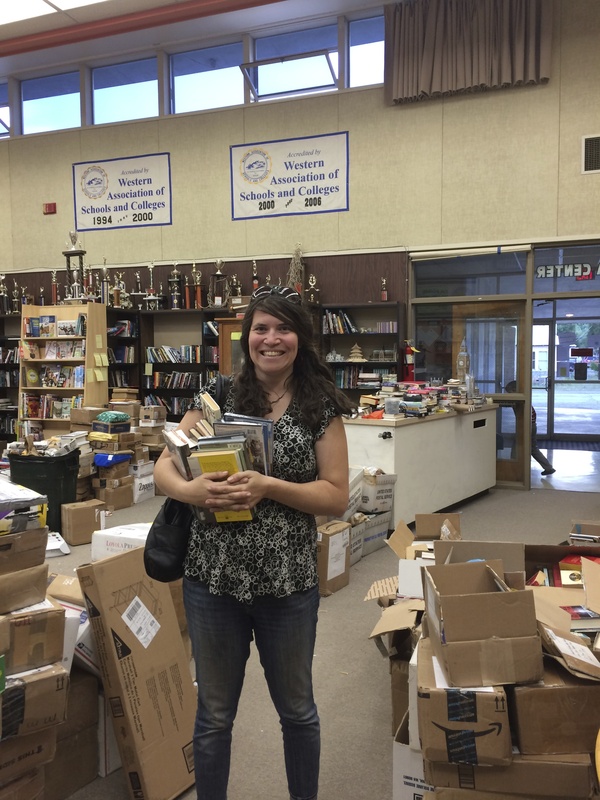 Adrienne is fighting the good fight to get more diverse readings selections in over at QJHS. Class sets. Because of you. Indian Valley Academy’s junior high are doing I am Malala in the fall as a class. They’re deciding a few others but they are so thankful that you helped with that! I think another class is doing The Book Thief. My kids and their friends had fun searching for duplicates and making up sets of books for the teachers to come in and see. We’ve also received a grant from the local rotary to order carousel computer desks for the computer area so that they feel more like individual work spaces. Right now the library kind of looks like semi-ordered chaos. Thankfully our staff of volunteers has many an admitted organizational freak (self-included). I will post photos as soon as it looks like something other than chaos. If you haven’t sent a book, please don’t! But alas where should you send them? In honor of us? Please send them to rural America. Every state has their rural America. It’s fully of half empty towns whose kids are languishing. I went to the neighboring town of Quincy last week and found out that 19 students in the 4 high schools run by Plumas Unified School district are pregnant as we speak. Given that our graduating classes combined of the four traditional public schools are only about 100 students that’s A LOT. I’m hoping too that the diverse books you sent will help our students grasp both their own place in the world and instill a sense of empathy in what they don’t know and what they don’t see. You have helped with all this wonder. Thank you again, you’re amazing. Here is a wonderful organization people can send books to: Reader to Reader – http://www.readertoreader.org. They get books to schools and libraries in need throughout the US and in other countries – generally books for kids, but they accept other books as well. I’ve mailed boxes to them, had them picked up, and have dropped them off! A great place, great people. and I am sorry, I picked two books but didn’t get them mailed. I know you are overwhelmed with the project, but if you happened to get notes from other areas/schools/libraries that would also like to receive some influx of books, we could get the word out for them also. I am not expecting you to look for them, but if they contact you, if you can share the contact info with those of us who would still ❤ to help. I will send on any names of any other communities/libraries that come my way.